After bacterial contamination of the abdominal cavity, a complex series of local events is initiated by the host in order to eradicate invading bacteria. This local host response consists of mechanical clearance of fluid and bacteria via diaphragmatic lymphatics, phagocytosis and destruction of bacteria by phagocytic cells, and sequestration of bacteria. After intra-abdominal inoculation, bacteria begin to disappear from the abdominal cavity immediately, even before the influx of phagocytic cells. Bacteria are recoverable from the right thoracic lymph duct within 6 min of intra-abdominal inoculation and from blood within 12 min. 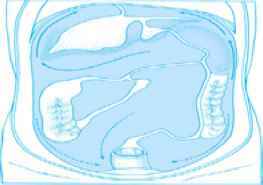 Bacteria are transported by abdominal fluid circulation via the paracolic gutters to the left and right subdiaphragmatic spaces ( Ay.tio.,1964) (Fig 1). They are absorbed into the diaphragmatic lymphatics via stomata between specialized peritoneal mesothelial cells, and are then carried to the bloodstream ( A,!le0„J,936) (Eig.;.,2). Fig. 1 Circulation of fluid and particles in the abdominal cavity: solid arrows indicate the direction of flow, generated by diaphragmatic movement and absorption of material from the diaphragmatic lymphatics; broken arrows demonstrate the effect of gravity in the upright position. Fig. 2 Schematic view of the peritoneal stomata and underlying lymphatic tissue. 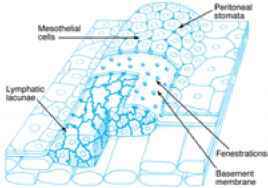 Over the lymphatics, mesothelial cells are small, with stomata between the cells. Through these stomata and corresponding fenestrations of the basement membrane, the abdominal cavity communicates with lymphatic lacunas which are lined by lymphatic endothelium. 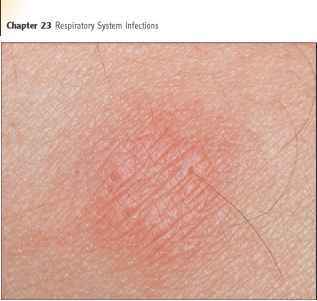 The second line of defense is phagocytosis with killing of bacteria by phagocytic cells. Phagocyte influx into the abdominal cavity is mediated by bacterial cell products (e.g. lipopolysaccharide), complement cleavage products (specifically C5a), inflammatory proteins (kinins, histamine), and cytokines such as tumor necrosis factor and interleukins 1, 6, and 8. Lipopolysaccharide, derived from Gram-negative enteric bacteria, is a particularly strong stimulus for release of cytokines by peritoneal macrophages. These enteric bacteria are most commonly found in intra-abdominal infectious processes. After chemotaxis, invading organisms must be ingested and destroyed. In particular, encapsulated micro-organisms are able to resist ingestion by human phagocytes and so must first be opsonized with a sufficient amount of specific antibody. On contact of the opsonized bacteria with the phagocyte, fusion processes are initiated, followed by degranulation of antimicrobial products that eventually kill the bacteria. The third line of defense is bacterial sequestration. Fibrin plays a crucial role in walling off infection by incorporating bacteria in its matrix and by creating a physical barrier against dissemination through formation of intra-abdominal adhesions. Fibrin also impairs clearance of bacteria from the abdominal cavity by occluding the diaphragmatic stomata. Local fibrin deposition appears to stimulate the inflammatory response by increasing vascular permeability and chemotaxis of neutrophils and monocytes. Through all these actions, fibrin protects the host against early systemic spread of bacteria. In critically ill patients these peritoneal defense mechanisms may fail to control intra-abdominal infection. As a consequence, the peritoneal cavity is flooded with infectious material and the peritoneal defense mechanisms may now have detrimental effects on the host. At least five interacting mechanisms are responsible for the failure to control infection: fluid exudation into the abdominal cavity, impairment of immunological defense mechanisms, adjuvant substances, bacterial synergism, and fibrin. 1. The influx of large amounts of protein-rich exudate into the abdominal cavity produces massive third-space fluid shifts. These exudates impair bacterial opsonization by diluting opsonins and reduce the ability of phagocytic cells to reach and phagocytose bacteria. Absorption of these intraperitoneal exudates and bacteria is disturbed by occlusion of the diaphragmatic stomata. 2. Immunological defense mechanisms are impaired by dilution of chemotaxic factors and opsonins by adjuvant substances and fibrin. Adjuvant substances (e.g. bile salts, gastric mucin, feces, barium sulfate, necrotic tissue, blood components, and foreign bodies) inhibit migration, phagocytosis, and the killing capacity of neutrophils and result in premature release of oxygen radicals by these cells. Impairment of phagocytosis may be due to (i) physical entrapment of neutrophils preventing locomotion, (ii) reduced opsonization of bacteria in a fibrinous environment, and (iii) premature release of lysosomal enzymes in the presence of activated complement components along fibrin strands. 3. Adjuvant substances not only impair immunological defense mechanisms but promote bacterial growth. For example, hemoglobin enhances bacterial growth and increases bacterial virulence. In vitro addition of iron to a culture medium enhances growth of Escherichia coli. 4. Lethality and the formation of residual abscesses are enhanced more by a polymicrobial intra-abdominal infection than by a monomicrobial infection. Synergism between anaerobic and aerobic bacteria plays an important role. In particular, the synergism between Bacteroides fragilis and E. coli has been studied both in vitro and in vivo. Possible mechanisms of synergy are (i) the ability of one species to provide growth nutrients for its bacterial partner, (ii) the ability of one species to impair host defenses, permitting its copathogen to survive and exert its intrinsic virulence, and (iii) the ability of the species to optimize local environment, thereby enhancing bacterial proliferation. 5. Fibrin entraps bacteria, providing a protected environment in which they can proliferate almost unaffected by neutrophils. Fibrin also impairs neutrophil function and blocks diaphragmatic stomata, thereby preventing absorption of intra-abdominal fluid and bacteria. Impairment of neutrophil function by bacteria, fibrin, and adjuvant substances is accompanied by premature extracellular release of neutrophil enzymes. These enzymes can damage viable tissue, resulting in necrosis. In addition to enzymes liberated by neutrophils, bacteria themselves produce a number of exoenzymes (e.g. hyaluronidase and lipase) that cause tissue destruction. In such an environment, characterized by hypoxia and a low pH, neutrophil function is further impaired and bacterial growth is stimulated. Tissue necrosis, fibrin, and bacteria augment the severity of the inflammatory process with continuous influx of neutrophils and macrophages. This process may readily become self-perpetuating, even in the absence of bacteria.